Everyone loves pizza. So much so that there’s an International Pizza Expo coming to Las Vegas. Pizza lovers, pizza makers and pizza restaurant operators can talk all things pizza at this year’s expo, which runs March 7 – 10 at the Las Vegas Convention Center. To celebrate pizza and the big expo, we asked some of our favorite food bloggers to come up with unique pizza recipes inspired by Vegas hotels. Here are the tasty pies they created. Follow the links to the blogs for full recipes. The Caesars Palace Pizza, courtesy of Vegetarian and Cooking! 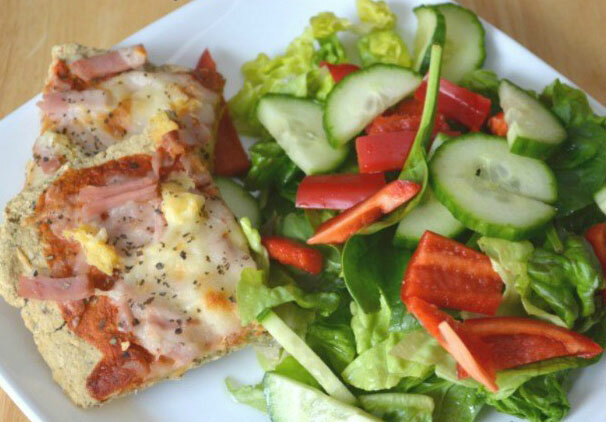 Alecia from Vegetarian and Cooking was inspired by Caesars Palace so she combined the best of pizza and Caesar salad. 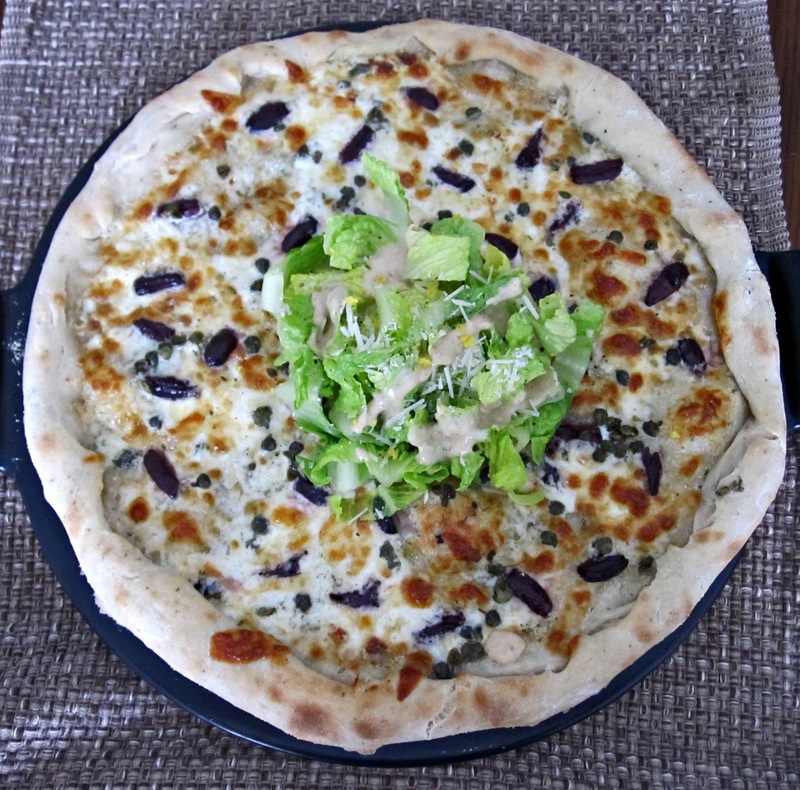 Her vegetarian pizza is made with black pepper dough, Parmesan Alfredo sauce, Caesar salad and toppings like lettuce, Kalmata olives and capers. Flamingo Pizza, courtesy of What’s for Dinner Moms? This pizza was inspired by the bright pink, red and green colors of the Flamingo hotel. 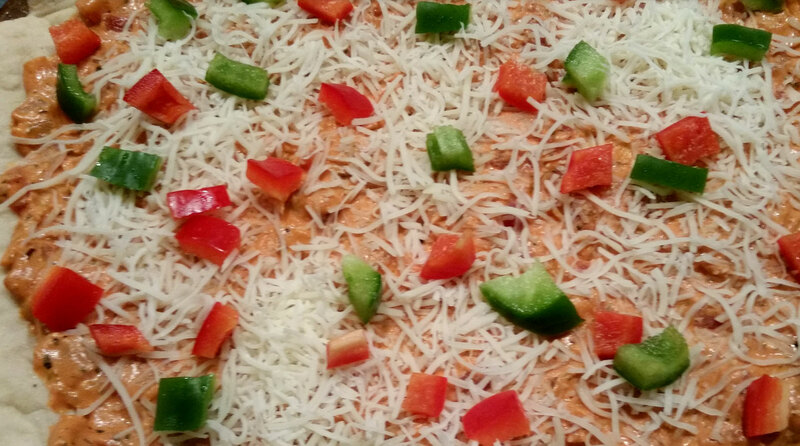 It’s made with tomato cream sauce and topped with red and green peppers, garlic shrimp and Parmesan cheese. Paris Las Vegas Pizza, courtesy of My Food Infatuation. 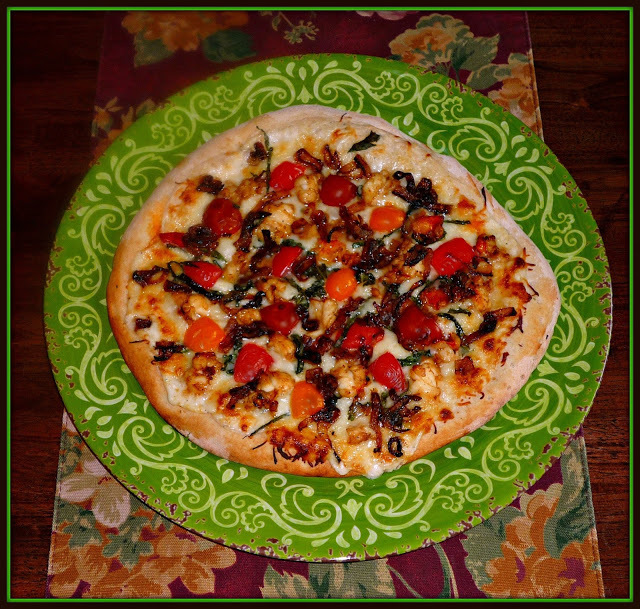 Simple and tasty French cooking was the idea behind this pizza inspired by Paris Las Vegas. 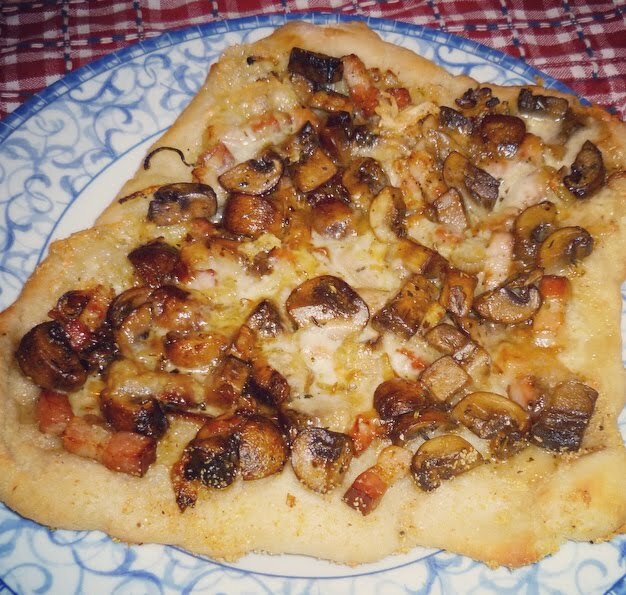 It’s topped with herbs de Provence, mushrooms, shallots, bacon and Camembert cheese. Bon appétit! Treasure Island Pizza, courtesy of Alicia’s Kitchen Antics. Alicia was inspired by the golden colors of Treasure Island so she came up with this golden colored pizza. It’s made with a butternut squash base and topped with goat cheese, pancetta and sage. Wynn Pizza, courtesy of The Food Temptress. Rekaya Gibson, aka The Food Temptress, was inspired by Wynn to created this filet mignon pizza with white truffle glaze. According to Gibson, the square pizza crust resembles the shape of the buildings and the sun-dried tomato pesto represents the sunny Vegas climate. The filet mignon represents the luxurious amenties the Wynn hotel has to offer. The pizza is topped with white glaze truffle with balsamic vinegar of Modena. Breakfast pizza, courtesy of Make It Easy Crafts. This blogger created a breakfast pizza with golden cheese nuggets. We think the Golden Nugget must have been her inspiration. 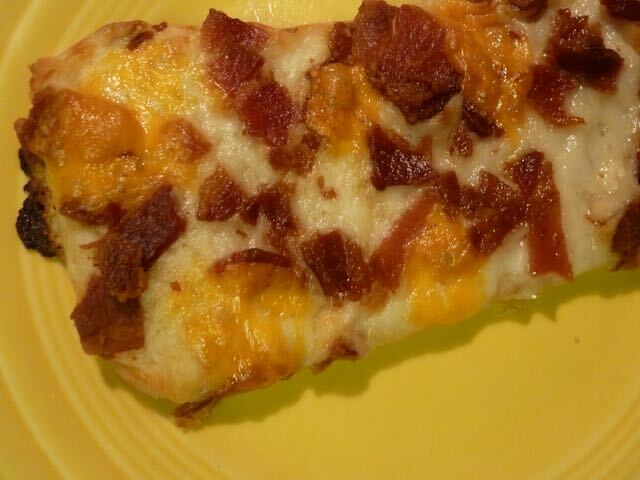 The flatbread pizza is topped with bacon and cheese. Sounds like a good way to start the day to us. Since this blogger loves Italy, she was inspired by the Italian-themed Palazzo. 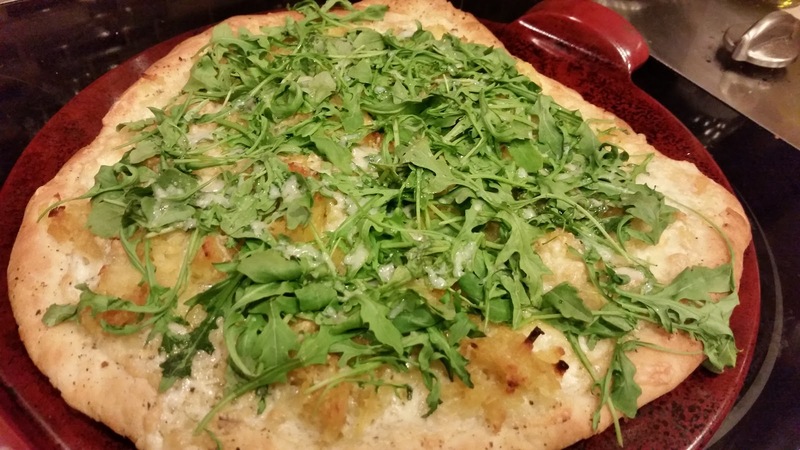 Her truffled patate pizza is made with hash browns, Fontina cheese, arugula and Parmesan. King Cake Calzone, courtesy of Mississippi Foodie. In honor of Carnival season, this pizza was inspired by the Mardi Gras Hotel & Casino. The King Cake Calzone is topped with ricotta, Andouille sausage, mozzarella, peppers and onions. Hawaiian Pizza, courtesy of Opera Singer in the Kitchen. This Hawaiian Pizza with an oat crust was inspired by the Flamingo hotel. Hanging by the pool and enjoying sunshine at this tropical-themed hotel sparked thoughts of this island pizza. 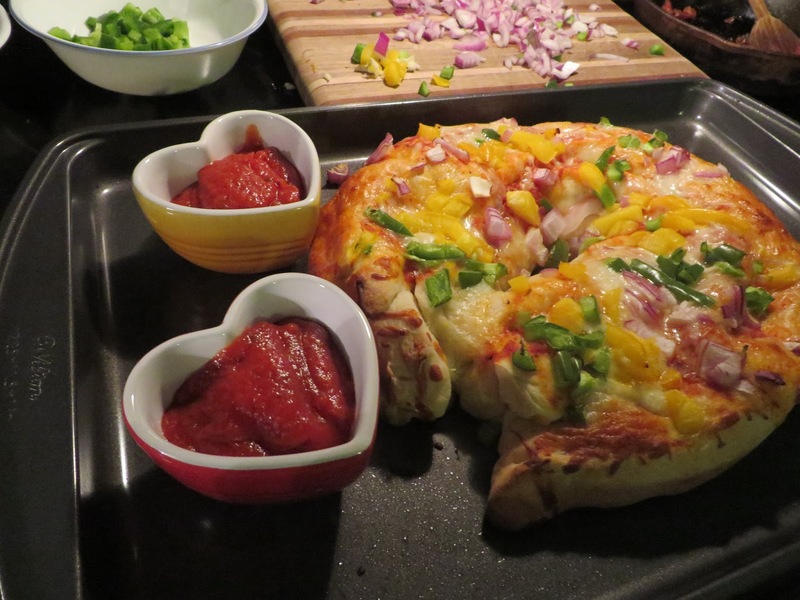 It’s topped with Canadian bacon, Mozzarella, pineapple and roasted sweet red bell peppers. Circus Circus Cotton Candy Pizza, courtesy of The Devilish Dish. Who says pizza has to be savory? The folks at The Devilish Dish were inspired by Circus Circus to create this fun, fanciful cotton candy pizza. 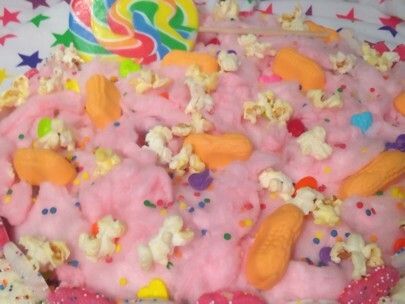 The dessert pizza is made with sugar cookie crust, buttercream frosting and toppings like circus peanuts, animal crackers and popcorn. Dessert pizza, courtesy of Foodie and The Hipster. 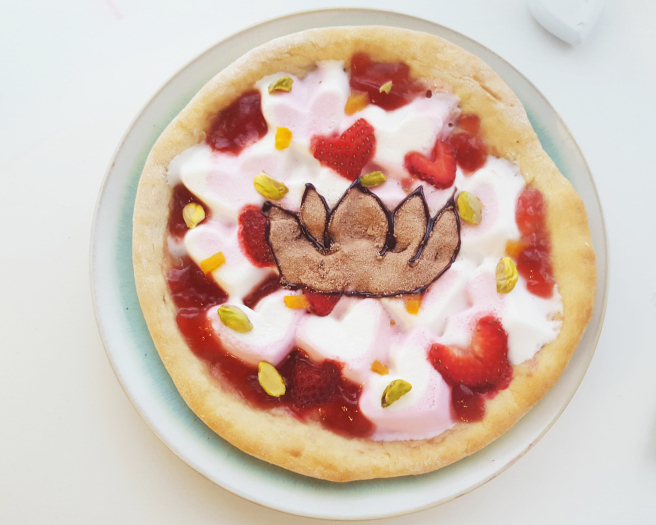 The bright pink logo of the Flamingo hotel inspired this dessert pizza. It’s topped with marshmallows, heart-shaped strawberries, peaches and pistachios. Paris Chicken Cordon Bleu Pizza, courtesy of Edible Life in YYC. This Canadian blogger was inspired by the Paris Las Vegas. 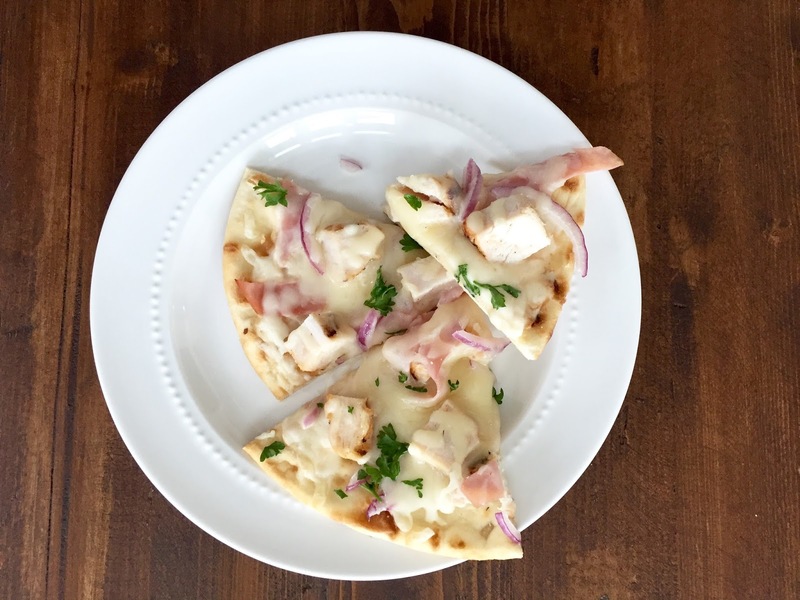 Since chicken cordon bleu is a French dish, why not turn it into a pizza? The pie is made with chicken, ham, Alfredo sauce, mozzarella cheese and Swiss cheese. Palazzo Margarita Pizza, courtesy of The Enchanted Cook. When you think pizza, you think Italy and the Palazzo hotel. 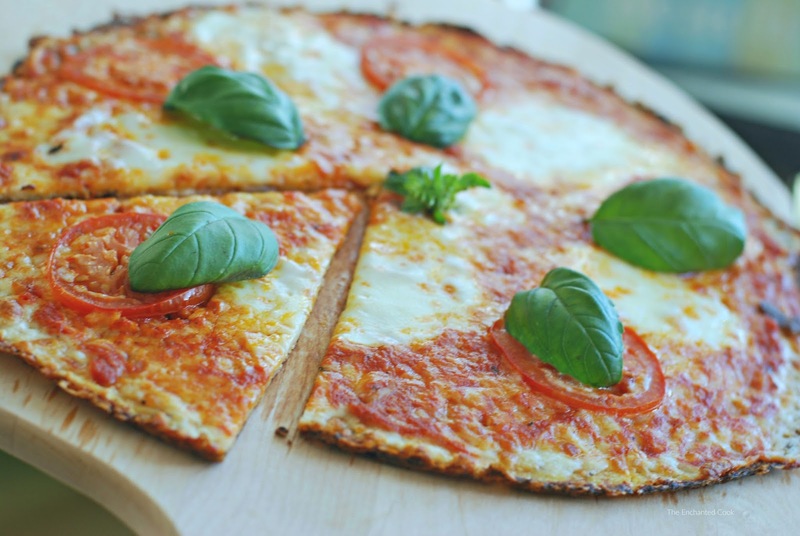 This pizza is made with a cauliflower crust and traditional margarita pizza toppings including Asiago cheese, tomatoes, Buffalo mozzarella and fresh basil. Caesars Palace Smoked Salmon Pizza, courtesy of Ja U Kuhinji. 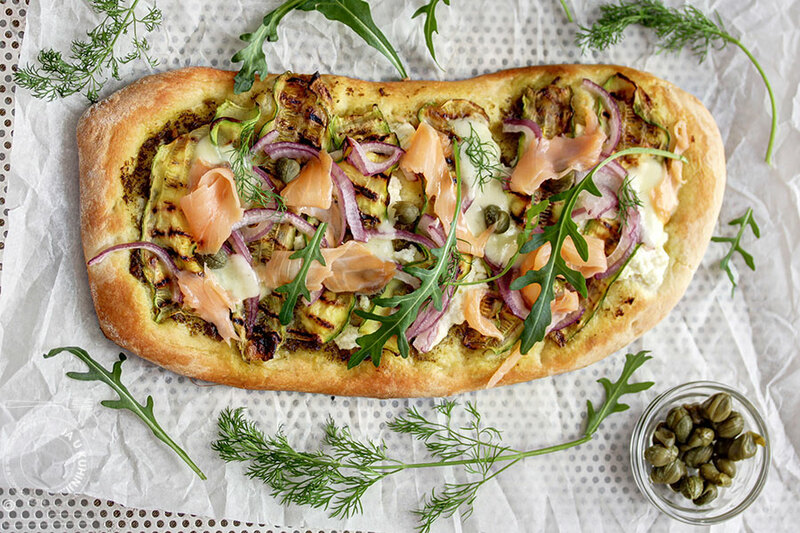 This smoked salmon zucchini pizza was modeled after Caesars Palace and includes pesto sauce, ricotta, zucchini and salmon. Pizza of Dreams with Lobster and Lemon-Garlic Cream Sauce, courtesy of The Weekend Gourmet. Wynn Las Vegas and its Lake of Dreams was the inspiration behind this “Pizza of Dreams with Lobster and Lemon-Garlic Cream Sauce.” Artisan pizza dough is spread with a homemade lemon and garlic cream sauce that’s covered with a blend of flavorful Italian cheeses. The pizza is then topped with chopped lobster tail, sautéed shallots, sweet baby heirloom tomatoes and fresh basil. BBQ Whiskey Steak Pizza, courtesy of Cooking from a Stay at Home Mom. 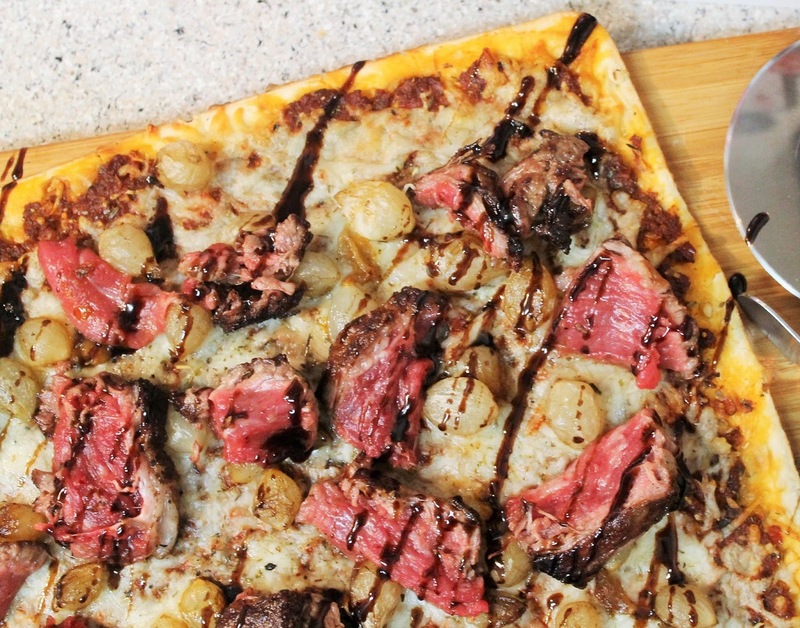 This BBQ Whiskey Steak Pizza was inspired by the MGM Grand. 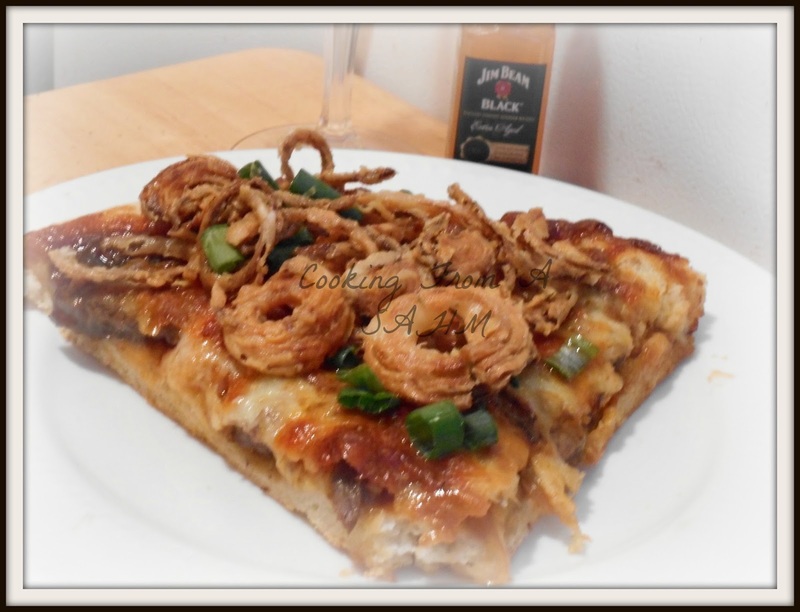 It’s topped with green onion and fried onion strings and has a whiskey and caramelized onion sauce. It’s finished with steak, mozzarella and Provolone cheese. White Chicken Pizza, courtesy of Hickory Ridge Studio. 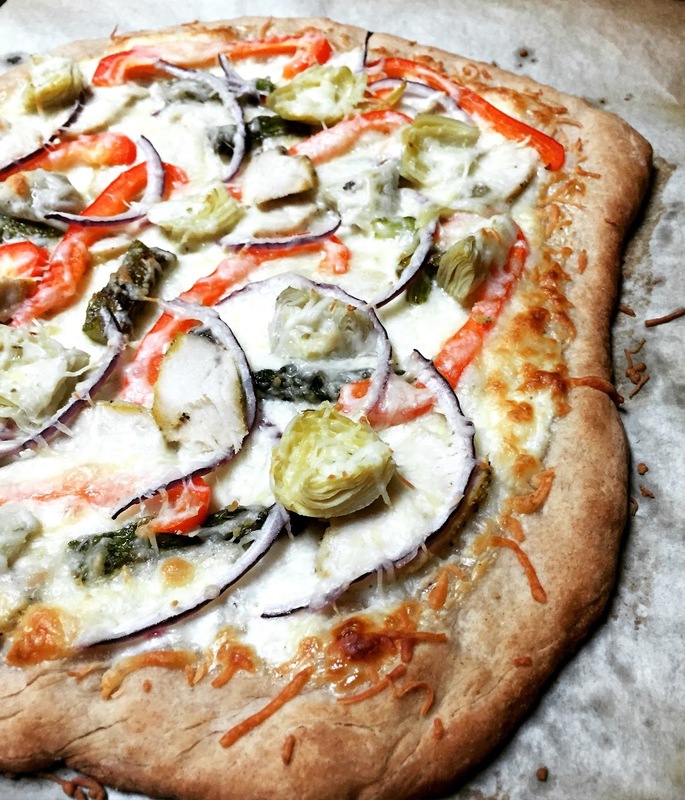 The Venetian hotel inspired this white chicken pizza. The crust is topped with white sauce, chicken, asparagus, fresh bell peppers, red onion, artichoke hearts and a blend of Italian cheeses. 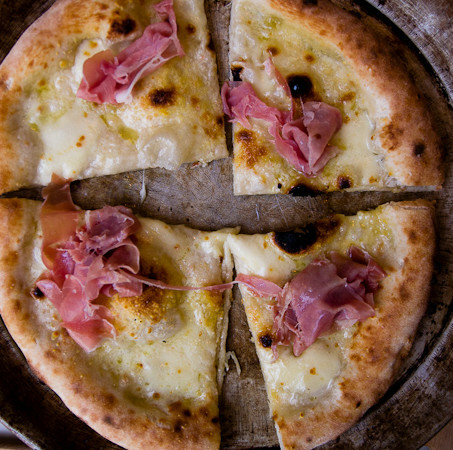 White pizza with fior de latte and proscuitto, courtesy of Feeling Foodish. 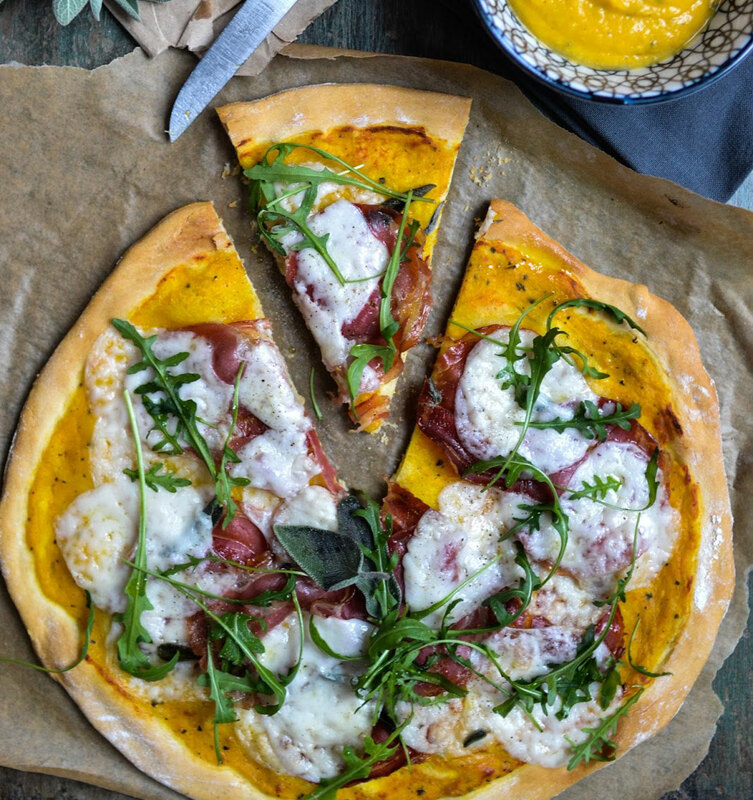 This blogger was inspired by Bellagio to create this white pizza with fior de latte (fresh mozzarella) and proscuitto. Thai Shrimp Pizza, courtesy of Kitchen Dreaming. This blogger was looking for some Asian fusion inspiration and found it at Mozen Bistro at the Mandarin Oriental. 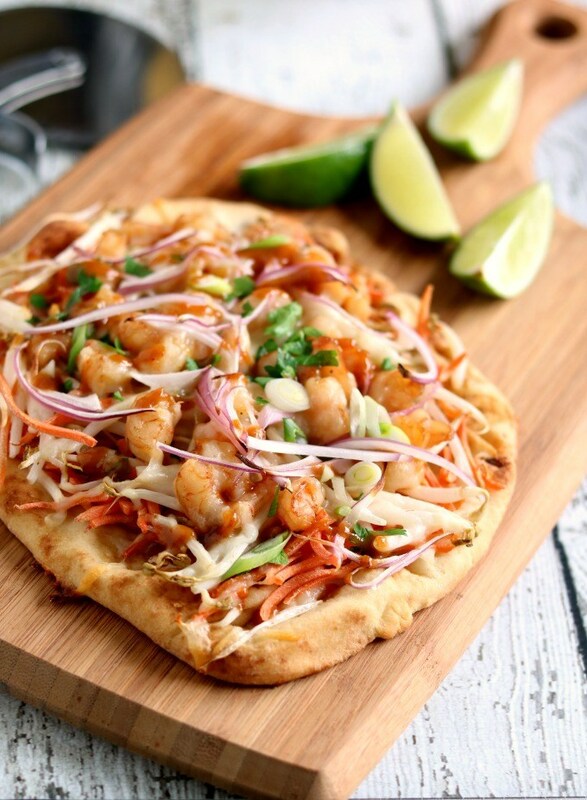 The Thai shrimp pizza is made with peanut sauce, shrimp, carrots, bean sprouts, red onions, mozzarella, peanuts and cilantro. Still hungry for more pizza? Check out these Vegas pizza places.